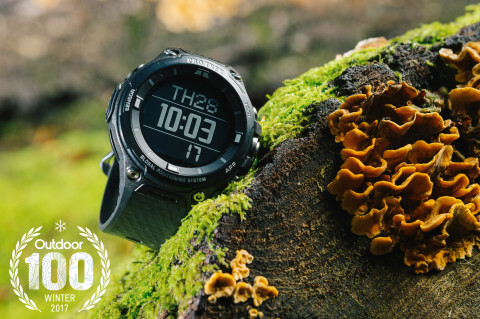 ViewRanger's Android Wear smartwatch app, in combo with the CASIO PRO TREK Smart watch, has been named as one of the top bits of kit for Winter 2017 by leading outdoors websites Mpora and Outdoors Magic. Read the full story and review here. The Outdoor 100 is described as 'your complete guide to this season’s latest and greatest bits of kit' and features everything from waterproofs, boots and rucksacks to tents, snowboards and ice axes - and of course apps! Well, just one app actually, and that's ViewRanger. Having already been featured in the Summer 2017 Outdoor 100 for our Apple Watch app, this winter inclusion is a further endorsement of ViewRanger's status as a leader in outdoor smartwatch technology. "Via the Google PlayStore, you can download additional apps for the Casio ProTrek, including the ViewRanger App. There’s a version of Viewranger that’s optimised specifically for the Casio ProTrek, which features a host of maps, route information and trails and you can access this easily via the watch. "A massive bonus is that the ViewRanger apps are accessible offline, so if you’re somewhere really remote, you can still use your navigation skills to find your way back to base. The maps appear really clearly on the screen of the ProTrek, and can be zoomed with either a pinch of the screen, or using the Tool and App buttons. "Spend a morning with the Casio ProTrek with the ViewRanger app installed, and you’ll start to wonder how you coped without it by your side before."